Problem Banks – The FDIC creates reports on problem or troubled banks in the aggregate. We do not make the details of this list publicly available. There’s always a reason for decreased transparency, and it’s always lame. You don’t have to name names, but you can say with some specificity the criteria you are using, as opposed to the vague report given here. Vagueness is never wrong, but its also never right. You might as well say, ‘we used our collective common sense’, but as common sense is inversely proportional to the size of the collective ‘we’, that insures it’s classic hindsight risk attribution. Eric Falkenstein is an economist who specializes in quantitative issues in finance: risk management, long/short equity investing, default modeling, etc. He is the author of the 2009 book Finding Alpha. 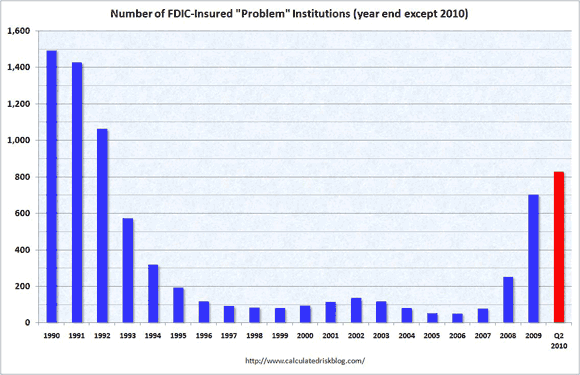 FDIC Poised to Seize Corus Bankshares, Inc.
FDIC Problem Banks List Balloons: What Recovery?